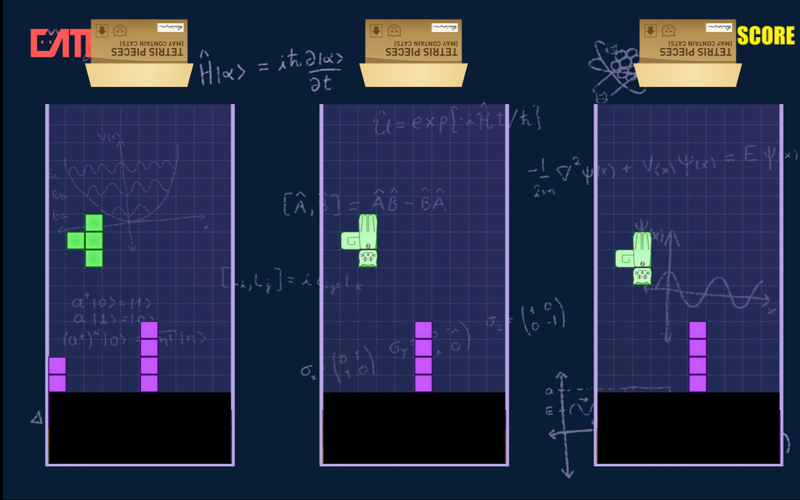 Quantum tetris pieces will lead your game into a state of superposition, where you play more than one screen simultaneously. 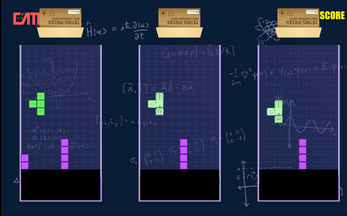 One screen will have the regular configuration, and the other will have the blocks tunneled to another position. Once you decide to observe your game's state, it will colapse back to normal. Arrows for controlling and space for observing. Made for the Quantum Game Jam 2015 with quantum experts John James Tello Cajiao and Francelino Carvalho, who also worked the graphics. Music was once again by Bruno Gazoni (brugazoni[at]gmail.com). The idea of the black sprite was to simulate quantum physic's uncertainty, in which a particle can be simutaneously in two different ways until you decide to look at it (which is what happens when you press space). And the music was purely Bruno's idea after hearing "Quantum Tetris. Go." He's amazing.